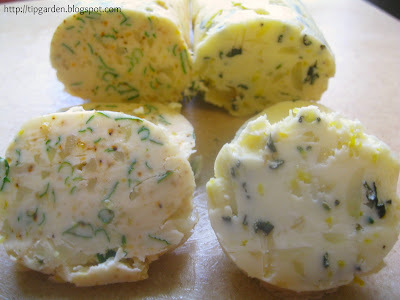 Mixing up your own rolls of homemade Garlic & herb butters is the kind of thing that your family and guests will flip over and think you've just really outdone yourself, yet only takes you a few minutes to do. 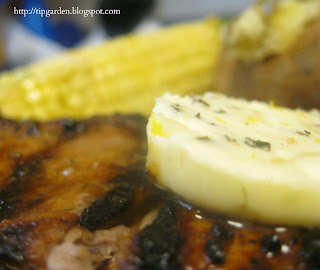 With fathers day this week, what would be better on a grilled steak than real homemade garlic butter? Wish you could see my husband and teenage son standing behind the camara drooling and telling me to hurry up and take the picture so they can dive into these steaks topped with my homemade Rosemary &amp; Garlic Butter! The corn on the cob had the chili, lemon, parsley garlic butter! but these are just ideas, you can really compound any combination of flavors you'd like to! 3 Tablespoons Chopped fresh herbs: examples: Rosemary, Parsley, Thyme, etc. Optional add-ins: 1/4 - 1 teaspoon (to taste) : Grated lemon zest, chili flakes, pepper, etc. On cutting board, smash 6-7 cloves of the roasted garlic. In small mixing bowl add softened butter, smashed garlic and all of your chosen herbs and seasonings. Mix till well blended with spatula. On work surface place sheet of plastic wrap or parchment paper. Put butter mixture in center of wrap/paper and shape into a 4-5 inch log. 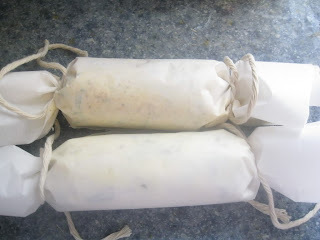 Roll up butter in plastic wrap or parchment paper to a round log Tie off ends with twine if needed. Refrigerate up to a week or can store in freezer up to a month. Jan's tip: a roll of this homemade garlic butter would make a great gift in a basket with a loaf of french bread!